UPDATE: Daffy’s filed for bankruptcy protection Wednesday, listing assets of as much as $100 million. The Secaucus, New Jersey-based retailer owes its 30 largest unsecured creditors amounts from $54,000 to $613,000, according to Chapter 11 documents filed yesterday in U.S. Bankruptcy Court in Manhattan. The company has a liquidation plan that will pay creditors in full by earning $59 million, mostly from selling its leases on its 19 stores, Law360 reported. Daffy’s has already set up a $43 million sale of the majority of its leases — including its 97,124-square-foot Herald Square flagship with a below-market rent — as well as its fixtures and intellectual property to an unnamed buyer for $43 million, according to a statement by Richard Kramer, the company’s vice president of finance. 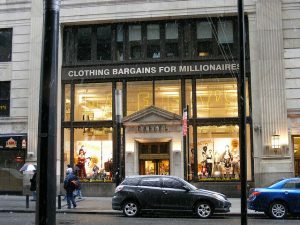 ORIGINAL ARTICLE: Discount clothing company Daffy’s, which announced last month that it was shuttering its 19 locations in the New York City metro area, has been acquired by a real estate investment firm that plans to sublease the store space. Aurora Capital Associates purchased the embattled retailer for an undisclosed sum, Real Estate Weekly reports. Daffy’s, founded in 1961, struggled to keep up with discount competitors T.J. Maxx, Nordstrom Rack and Century 21. Chief Executive Marcia Wilson, the daughter of late founder Irving Shulman, had searched for a financial partner for about two years. Daffy’s has leases in some of Manhattan’s busiest shopping areas; the store locations include 28,000 square feet on 44th Street by Times Square, 54,000 square feet on East 57th Street, 30,000 square feet on Broadway in SoHo and 18,000 square feet in Atlantic Terminal in Brooklyn. The lease on the 50 Broadway SoHo store will not expire until 2025, and the lease on the 462 Broadway location will not run out until 2024. Aurora has been involved with a joint development deal that leased space to shoe seller DSW for a flagship store at 301-303 West 125th Street. Newmark Grubb Knight Frank‘s Jeffrey Roseman told Real Estate Weekly that Daffy’s real estate could be a boon to Aurora. “Vornado did it years ago with Alexander’s Department Stores,” he said. Alexander’s shut down in 1992 and its Lexington Avenue store was demolished in 1999 to make room for The Bloomberg Tower on 731 Lexington Avenue. “I still think that was probably one of the greatest real estate transactions of my time,” Roseman told Real Estate Weekly.